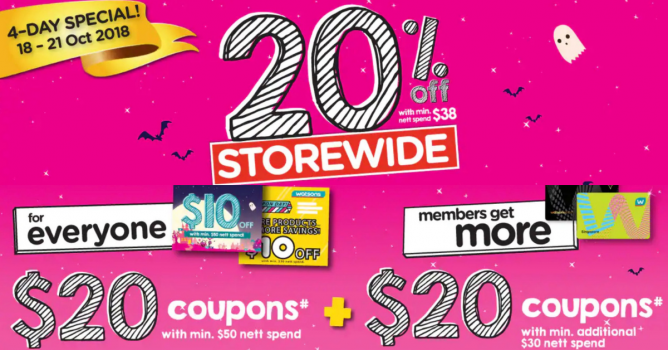 Home > Toiletries > Watsons: 4-Day Only Storewide Sale @ 20% OFF + Members-Only $40 Coupons Giveaway! 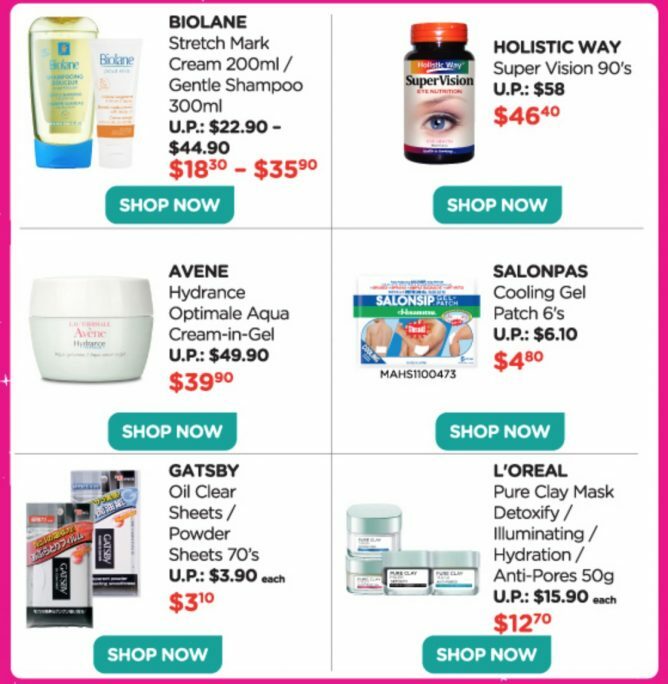 18 - 21 Oct 2018 Watsons: 4-Day Only Storewide Sale @ 20% OFF + Members-Only $40 Coupons Giveaway! Watsons' Halloween Sale continues with 4-day only storewide sale! Get 20% off storewide with minimum spend of $38 and members get $40 coupons (in $10 denominations) for your next purchase with minimum $80 spend! T&Cs apply. Shop now at the nearest Watsons stores or shop online! Promo is from 18 to 21 October 2018. 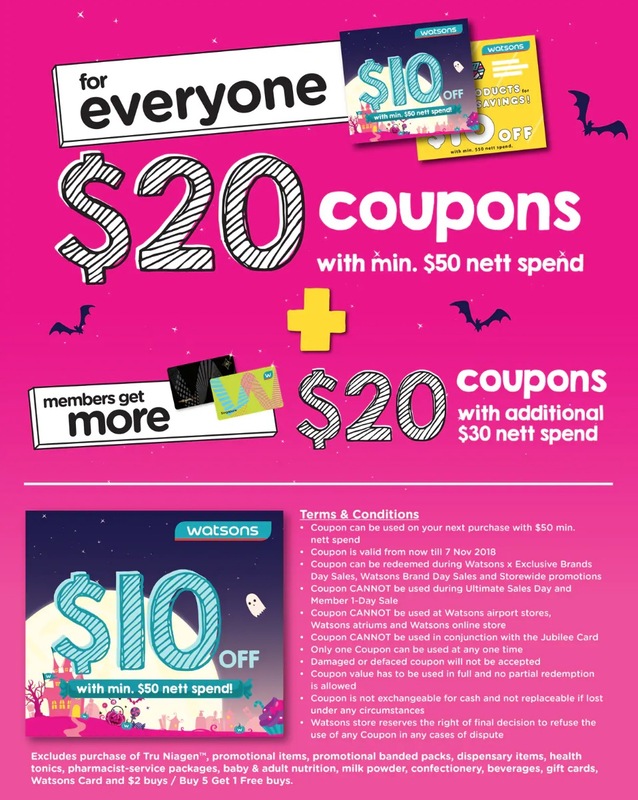 Promotion: Watsons 4-Day Only Storewide Sale @ 20% OFF + Members-Only $40 Coupons Giveaway! • Promotion is valid from 18 - 21 October 2018. • Storewide 20% discount is valid with min. $38 nett spend* in a single receipt. • Coupon can be used on your next purchase with $50 min. nett spend. • Coupon is valid from now till 7 November 2018. • Coupon can be redeemed during Watsons x Exclusive Brands Day Sales, Watsons Brand Day Sales and Storewide promotions. • Coupon CANNOT be used during Ultimate Sales Day and Member 1-Day Sale. • Coupon CANNOT be used at Watsons airport sotres, Watsons atriums and Watsons online store. • Coupon CANNOT be used in conjunction with the Jubilee Card. • Only one Coupon can be used at any one time. • Damaged or defaced coupon will not be accepted. • Coupon value has to be used in full and no partial redemption is allowed. • Coupon is not exchangeable for cash and not replaceable if lost under any circumstances. • Watsons store reserves the right of final decision to refuse the use of any Coupon in any cases of dispute. • Excludes purchase of Tru Niagen, promotional items, promotional banded packs, dispensary items, health tonics, pharmacist-service packages, baby & adult nutrition, milk powder, confectionary, beverages, gift cards, Watsons Card and $2 buys / Buy 5 Get 1 Free buys. Next: Petit Bateau: Pre-Festive Sale with Up to 80% OFF Babies, Kids, Ladies Apparels & Accessories!